Even grocery stores carry tomatoes in a range of colors in 2019….let’s talk about how we got here. Each day I receive gardening emails. They are uniformly wonderful, insightful, and interesting - as well as deeply appreciated. An email received a few days ago from a Washington state gardening friend, David, was just remarkable. It was amazing to find that we have much in common (even the names of our wives!). What really struck me, though, is that he suggested a topic that has been on my mind recently. I hope that this blog fulfills your request, David! This is turning out to be a really meaty topic, so I am going to do it in three parts….Part 1 (this blog) will provide a bit of background and look at US tomato history up until the advent of hybrids, starting in 1950 or so. Part 2 will cover Burpee’s Big Boy and what follows through the early days of heirloom tomato popularity. The final part will focus on where we are, and possibilities of future directions. When I joined the Seed Savers Exchange in 1986, the organization was just 11 years old. The major annual seed share offering, known as the yearbook, underwent a major format shift, providing listings by type of plant and variety, rather than by member codes, thus making it much easier to peruse the full gamut of each veggie or fruit type. Growing heirlooms was still considered to be on the fringe. The major seed companies, and tomato research and development, focused on steady parades of new hybrids each year. Small seed companies focusing on open pollinated, rather than hybrid, offerings were sprouting quickly, led by outfits such as Seeds Blum and Southern Exposure Seed Exchange and Gleckler (the first company to offer the really odd and unusual!). Here we are in 2019, the SSE is now 44 years old, Seeds Blum and Glecklers are no more, but Victory and Baker Creek and High Mowing and Fruition and countless others vie with ebay and Amazon sellers to create a baffling array of choices, with selection and quality and pricing all over the map. It is much more than heirlooms popping up in the tomatosphere - our own Dwarf Tomato Project, long time breeding efforts by Tom Wagner, Brad Gates, Fred Hempel and many others are blurring the definition of heirloom and increasing the available tomato number to the many thousands, represented in every possibly imagined combination of fruit shape and size and color and plant habit and leaf shape - even foliage color. We are at a true pinnacle of tomato diversity. I’ve read articles through the years that opine on the use - and even definition - of “heirloom”. It has always been clear to me, perhaps because of my love of genealogy, history, stories and family. I think of it in general terms - the dictionary definition of “heirloom” is “a valuable object that has belonged to a family for several generations”. Some use the term “heritage” - “property that is or may be inherited”. In both cases, hybrid varieties are eliminated, because they can not be passed down from saved seed. I have great discussions with my Oregon friend Mike Dunton of Victory Seed Company, and we’ve often discussed usage of the term “heirloom”. Since I tend to focus on tomatoes, I’ve applied a yardstick of around 1950 as a cut off date for designating varieties “heirloom” or simply “open pollinated” (equally valid terms for genetically stabilized varieties). When Burpee created and released their hybrid tomato Big Boy in 1949, it signaled a shift in the efforts of seed companies toward hybrid varieties rather than stabilized open pollinated varieties. This, of course, leaves more recently created types outside of the heirloom descriptor (varieties such as Green Zebra (1970s), Cherokee Chocolate and Lucky Cross (1990s), and our Dwarf Tomato Project varieties (2010s).) When will they be considered heirlooms, rather than simply open pollinated varieties? This is where we hit a grey area and opinions proliferate. I stated above my rationale for the 1950 cut off for tomatoes (heirloom vs open pollinated). What about corn, or peppers, or eggplants? Each crop type has its own history, its own progression of a move from traditional breeding, selection and development of stable open pollinated varieties that end up in seed catalogs, toward selling of the actual hybrids. Some crop types still focus on open pollinated varieties to this day - beans, for example. This is actually an interesting topic to dig into at another time, but for now, let’s stay on tomatoes. 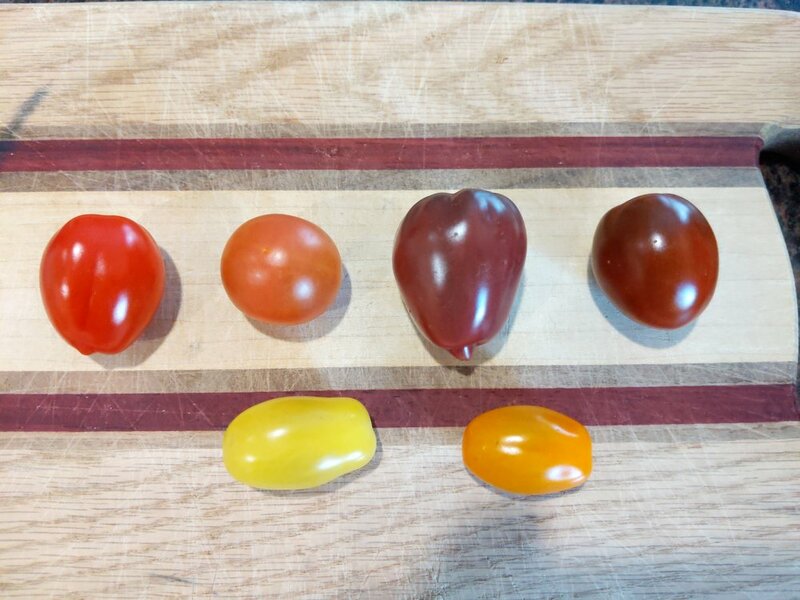 Let’s look at “heirloom” varieties that were the best known at a few points in time. In truth, we don’t have to go that far back to see the very beginnings of tomato breeding and improvement in the US. Alexander Livingston, who had the ingenuity to do his tomato development by doing single plant, rather than single fruit, selection, led the way in expanding a handful of lumpy, irregular mostly red (along with an odd pink or yellow) tomatoes to dozens of “improved” varieties, typically smaller in size and smoother in contour. From his first important release, Paragon, in 1870, nearly 30 new varieties were introduced by 1911, as shown in the catalog scan below. 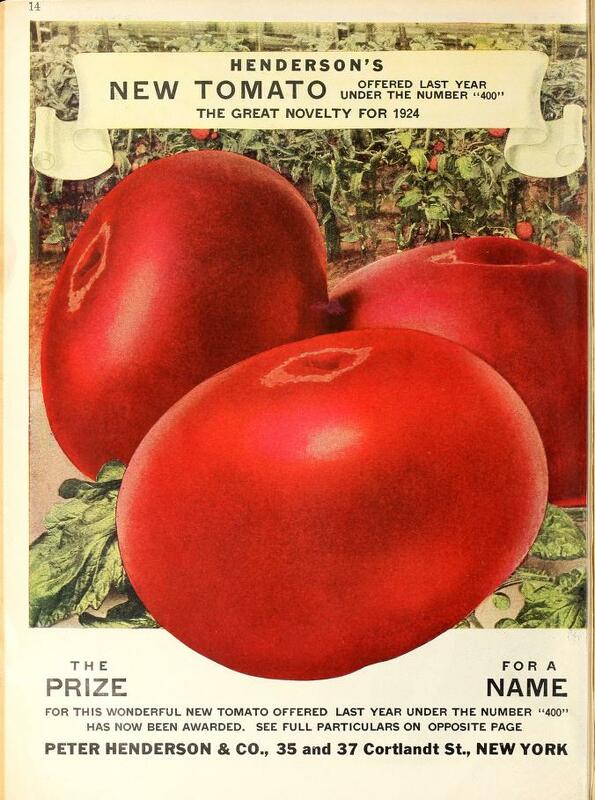 I suspect that most tomato growing gardens back then included a good number of these historic varieties, such as Paragon, Acme, Golden Queen, Stone, Globe and Beauty (note how simple and relatively unimaginative these names are, when compared with those of some of the popular heirlooms and hybrids known today). 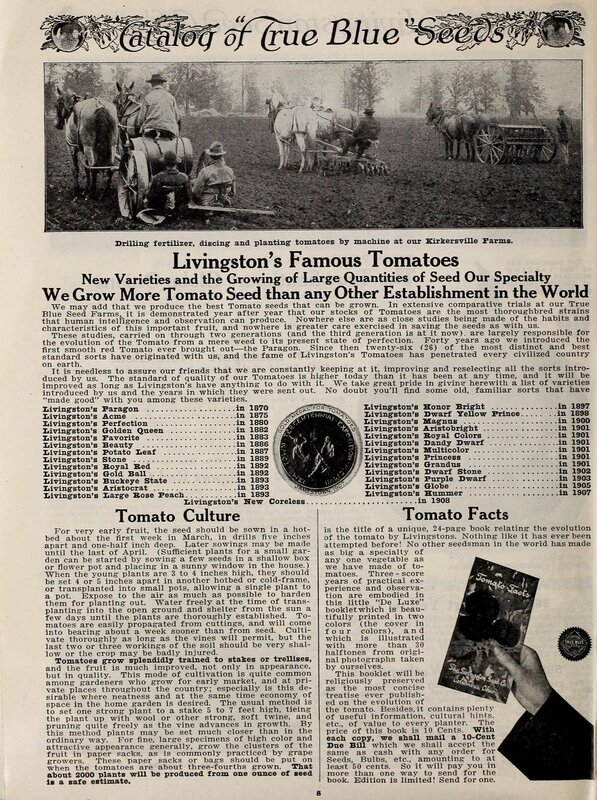 Of course, Livingston was joined by many other seed companies, some with significant tomato development efforts, such as Henderson, Burpee, Salzer and Maule. Aside from the Livingston varieties noted above, other varieties were very widely grown, such as Ponderosa, Mikado, Earliana, June Pink, Matchless and Chalk’s Early Jewel. Seed companies developed new varieties by growing large plantings of known types and seeking the unusual single plant (indicative of a mutation or a cross) from which to develop a new tomato. Some companies crossed two known varieties to create a hybrid, then worked with seeds saved from the hybrid to find something distinct and worthwhile in the segregates that arose from growing out the second and beyond generations. (This is the process we are using in our Dwarf Tomato Project). Between 1911 and 1950, a few varieties gained great prominence and can also be considered heirlooms, such as Marglobe, Rutgers and Pritchard Scarlet Topper. The above all represent a type of heirloom that I call “commercial heirlooms”. Gardeners today are much more familiar with “family heirlooms”, tomatoes that come to us with stories, such as Cherokee Purple or Brandywine. Though numbering in the many thousands, they tended to be extremely local - perhaps growing in one garden, one farm, one city. It is the formation of the Seed Savers Exchange in 1975 that provided the mechanism for those particular types to be more widely shared. Part 2 will focus on the period from 1950 (Burpee and their hew hybrid Big Boy) to 2000 or so, where the effects of the work of the SSE and the many seed companies that arose really impacted gardens all over the world.